We have heard from many customers about their challenges with detecting highly evasive threats. 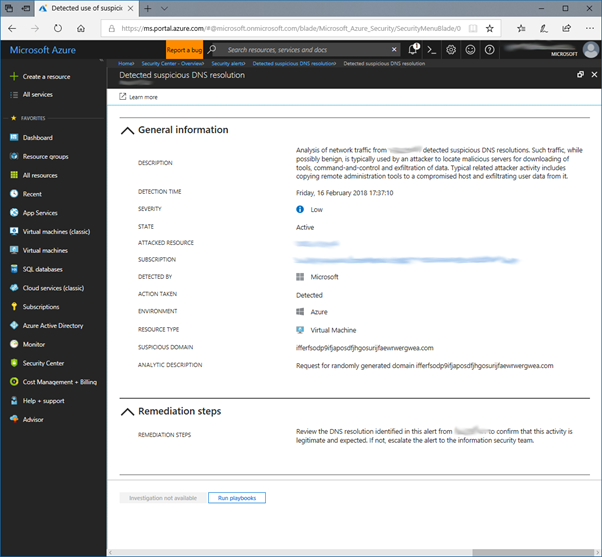 To help provide guidance, we published Windows DNS server logging for network forensics and the introduction of the Azure DNS Analytics solution. Today, we are discussing some of our more complex, heuristic techniques to detect malicious use of this vital protocol and how these detect key components of common real-world attacks. These analytics focus on behavior that is common to a variety of attacks, ranging from advanced targeted intrusions to the more mundane worms, botnets and ransomware. Such techniques are designed to complement more concrete signature-based detection, giving the opportunity to identify such behavior prior to the deployment of analyst driven rules. This is especially important in the case of targeted attacks, where time to detection of such activity is typically measured in months. The longer an attacker has access to a network, the more expensive the eventual clean-up and removal process becomes. Similarly, while rule-based detection of ransomware is normally available within a few days of an outbreak, this is often too late to avoid significant brand and financial damage for many organizations. These analytics, along with many more, are enabled through Azure Security Center upon enabling the collection of DNS logs on Azure based servers. While this logging requires Windows DNS servers, the detections themselves are largely platform agnostic, so they can run across any client operating system configured to use an enabled server. A bad guy seeking to gain access to a cloud server starts a script attempting to log in by brute force guessing of the local administrator password. With no limit to the number of incorrect login attempts, following several days of effort the attacker eventually correctly guesses the perceived strong password of St@1w@rt. Upon successful login, the intruder immediately proceeds to download and install a malicious remote administration tool. This enables a raft of useful functions, such as the automated stealing of user passwords, detection of credit card or banking details, and assistance in subsequent brute force or Denial-of-Service attacks. Once running, this tool begins periodically beaconing over HTTP to a pre-configured command and control server, awaiting further instruction. This type of attack, while seemingly trivial to detect, is not always easy to prevent. For instance, limiting incorrect login attempts appears to be a sensible precaution, but doing so introduces a severe risk of denial of service through lockouts. Likewise, although it is simple to detect large numbers of failed logins, it is not always easy to differentiate legitimate user activity from the almost continual background noise of often distributed brute force attempts.